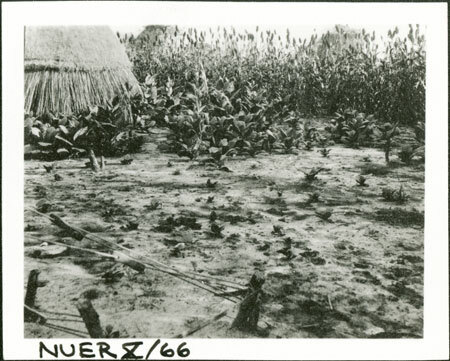 Looking across a kraal (notice tether posts and tethers in foreground) towards millet (and ?tobacco) plants growing at the back of a hut. According to the film number the location is probably at the mouth of the Nyanding among the Gaajok where Evans-Pritchard spent 4 weeks at the village of his servant Tiop, whom he had known from his 1931 fieldwork. Note on print reverse ms pencil - "83 3" & print front border ms ink - "NUER X/66"
Morton, Chris. "Nuer millet garden" Southern Sudan Project (in development). 03 Jan. 2006. Pitt Rivers Museum. <http://southernsudan.prm.ox.ac.uk/details/1998.355.481.2/>.